We are to request on a daily basis that God will be magnified in our lives and that He will provide, pardon, and protect us. Now that we have reviewed the previous posts, let’s take a closer look at the next section of the prayer. The second,”we” petition in Matthew’s gospel says, “forgive us our debts as we also have forgiven our debtors”. Luke’s version says, “forgive us our sins, for we also forgive everyone who sins against us”. What happened to trespasses? How do we know whether to say debts, trespasses or sins? Surprisingly, the King James Version does not have trespasses either, but debts and sins in both accounts in the gospels. However, the word, “trespasses” is used in the KJV in verses 14 and 15 of Matthew 6, after the end of the Lord’s Prayer. Evidently this was a word used by the Episcopalian and Catholic faiths in their translations of the text. What then did Jesus mean by the phrase, “forgive us our debts, trespasses, and sins, as we forgive those who do these same things to us”? In the second half of the petition, (Matthew 6:12 and Luke 11:4), “as we forgive our debtors, or those who have sinned against us”, the Lord’s Prayer seems to make a connection between the forgiveness we receive and the forgiveness that we offer. Could this be right? In the two verses immediately following the Lord’s Prayer, Jesus says, “For if you forgive other people when they sin against you, your Heavenly Father will also forgive you. But, if you do no forgive others their sins, your Father will not forgive your sins”. Later in Matthew 18:23-34, Jesus tells a parable of a servant whose master forgives an enormous debt. The servant then turns on one of his fellow servants and refuses to forgive even a small debt. When the master found out about the servant’s actions in light of what he had just done for him, he had the servant thrown into prison and tortured. Later, when Jesus was crucified, He followed His own words with actions from the Cross as He cried out, “Father forgive them for they do not know what they are doing” (Luke 23:34). When people do us wrong, they put themselves in our debt. How will we react when we are asked to forgive like we are trusting that God will do for us? If we forgive, we are showing our family resemblance to our Father in heaven. If we choose not to forgive, the text is very plain that God won’t forgive us either. So the forgiven must forgive; otherwise we are not grasping the concept of what grace really means. Just as Jesus forgave His trespassers while He was hanging from the cross, we also, must forgive. For like the angry mob, we also “do not know what we do”. Freely we have received and freely we must give! Knowing that our forgiveness from God depends on our ability to forgive our neighbor is a sobering, yet revolutionary concept from the Text that challenges us to be more like Christ in our dealings with our fellow man. In our fourth post on the Lord’s Prayer we will begin our look into the three requests that Jesus asked us to make to “Our Father” on our own behalf. The first of these three “we petitions” is, “give us today (Luke says, “each day”) our daily bread” (in Hebrew, Et Lechem Chu’Keinu Tein Lanu Ha Yum). Let’s examine this phrase in detail in light of culture and history and see what we find. First, we must note that the beginning of the phrase says to, “give us” not, “give me”. This continues the theme of “Our Father” that we discussed in our second post and suggests that we should not just focus on our own needs but our community as a whole. This concept of us vs. me continues through all of the petitions in the Lord’s Prayer and conveys a mindset of not just thinking of ourselves but others as well. Why does Jesus have us pray for bread and not some other foods as well? In Hebrew, the word for bread, ”Lechem”, can also mean food in general. When Jesus broke bread and blessed in Matthew 14:19, he was thanking His Father for the whole meal. Bread is the staple food of Middle Eastern people so bread symbolizes not only what we eat, but God’s provision for all our needs as well. In John 6:35, Jesus says, “ I am the bread of life”, suggesting that He is all we need and will provide all we need in this life. What about the word, “daily”? The Greek word that is translated “daily” is “epiousios”, but this is the only place in the Bible or any other Greek literature where this one word is used. This causes tremendous hardships for the translator because there is no place else to compare what this word might mean. Kenneth Bailey in his book, “Jesus Through Middle Eastern Eyes” (pp. 119-122) has a very interesting four page discussion on the different ways that scholars have wrestled with how to interpret this singular Greek word. For the purposes of this post we will attempt to simplify our discussion by looking back to the Old (Hebrew) Testament for some answers to the meaning of “daily” bread. The words “daily bread” certainly brings to mind the manna in the desert. If you will remember the story, God miraculously provided the need of the Israelites each morning in the form of manna. He gave them strict orders just to pick up enough for their families needs for that day. If they tried to store and save it, it ruined and was not fit to eat. They had to trust God that He would provide again for them in the same way the next morning. The phrase, “give us today our daily bread” then certainly speaks of asking God to take care of our families today and trusting Him to do the same tomorrow and in the future. It has been said that the definition of worry is wondering if God will provide tomorrow’s bread today. We have a tendency in the United States to be myopic and think that the Lord’s Prayer was just given to us. 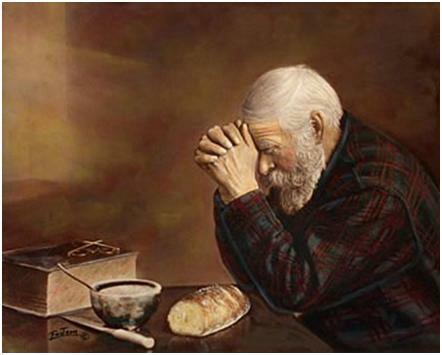 Praying for daily bread is a hard concept for Americans to grasp. We don’t worry if we are going to have food to eat, we are trying to decide what kind of food we’ll have, Chinese, Mexican or Italian! We don’t really think of God providing our daily bread, we’ve already got it covered. However, this is not the case in most of the world. An Ugandan pastor who came to America to study at a seminary for a year was asked what he would most remember about America when he went home. He replied, “I will never forget this one year when I did not need to worry about food”. Another quote from a foreigner who got to visit America exclaimed, “America is amazing, even the poor people are fat!” In light of the poverty throughout the ages and in the rest of the world today, and the anxiety that so many have just to get enough to eat each day, Jesus’ prayer for daily provision makes perfect sense. Americans however, have difficulty thinking about God being our daily provider and don’t often remember to give him credit. There is also an Old Testament verse, with which Jesus would have been familiar, that may add some additional insight into the meaning of our daily bread. Paraphrased, Proverbs 30:8-9 says, “please don’t give me poverty or riches, but give me only my daily bread (just enough).” The writer is implying that too much makes us forget God and think we are providing all this bounty by ourselves and too little turns us into being so desperate that we break God’s laws to get something to eat. This also supports the same thought as God providing just enough manna for today’s needs. To summarize the phrase in English, “Give us today our daily bread”, we are asking God to give us just enough bread (today’s bread) for today. If we are hungry, deliver us from the fear of not having enough to eat and if we have plenty for today don’t let us forget where it came from. Give us confidence that tomorrow we will have enough and keep us from worrying about tomorrow’s bread today. Although this seems a simple concept, to master it brings the peace that only the author of the Lord’s Prayer can give to his followers. In our next post we will look at the principles of forgiveness as set out in this ancient prayer. In our third post we will tackle the second phrase of the Lord’s Prayer, “Thy Kingdom come (tamklikh malkhutkha), thy will be done (yei’ase retzonkha), on earth as it is in heaven (ba-shamayim u-va’aretz). The teachings of Jesus on the subject of the “Kingdom of God”, or the “Kingdom of Heaven” are found in many places in the gospels and have been discussed and debated extensively throughout the centuries. In this post, we will not try to cover all the many facets of this important subject, but we will attempt to understand what Jesus would want us to know about praying for His Father’s Kingdom to come and His will to be done. As we shall see, knowing that this was how they prayed and how they viewed God’s Kingdom will really help us to understand the Lord’s Prayer. We have always been taught that, “Thy Kingdom come”, meant God’s second coming, as in “Come soon Lord!” This may well be a part of the meaning, however, the Kingdom is much more complex than just His second coming and contains several paradoxes that are hard to comprehend. Let’s look at the paradoxes as they are presented in the gospels. First of all, we know from Jesus’ teaching that the Kingdom of God has already come in the person of Christ (Luke 11:20). Yet, in the Lord’s prayer it sounds like we are to ask for it to come, and speaks of a future time when it will show up. In essence, the Kingdom is both “already” and “not yet”. Secondly, we know that the Kingdom of God is near as Jesus stated in (Mark 1:15). Yet, in (Luke 19:11-27) Jesus told a parable to a crowd of people that were expecting the Kingdom of God to appear immediately, telling them that the Kingdom was not near but was to appear at some time in the future. So, the Kingdom is near, but far away. Thirdly, it also seems from the gospels that the time of the coming of the Kingdom is unknown and unknowable (Matthew 24:36), but yet in Matthew 24:3-35 and Luke 21:5-36, Jesus gives us the signs that tell us when the Kingdom will be coming! The Kingdom then is unknown, yet known. Finally, read Luke 17:20 where it says that, “the Kingdom of God is within you”, yet it is also described as an outward event that we can see with our eyes. The Kingdom is both within and without. In light of these apparent paradoxes, how do we know what we are praying for when we pray for his Kingdom to come? The answer lies in the ancient prayer that we cited at the first of our post. The ancients prayed that all the world would come to know, worship, and serve the Jewish God and that the people would be subject to His rule and reign. By praying for His Kingdom to come and His will to be done here on earth, we are praying for the gospel to go forth and for people to be subject to His Kingship with all that entails. Instead of just standing by waiting for the world to come to know Him, we are to be actively making His Kingdom come by bringing people to a knowledge of Him and to worship Him as their Lord and King. To have a Kingdom, you have to have a King, and subjects who obey the King and live according to His laws. Jesus, in the Lord’s Prayer, was talking about Gods’ rule and reign over the daily lives of His people and not just a future time when He would show up in power at the end of time. This makes perfect sense when added to the next line in the Lord’s Prayer, “On earth like it would be in Heaven”. As His disciples, we are to expand His reign over the earth so that His will is done, just like it would have been done in heaven. To say that, “His will be done”, implies that we have a choice whether to obey God’s will or not and we must accept responsibility for what we do here on earth. Even here, there is a paradox as God is sovereign and directs history – His will is always done. Yet somehow, we are free to oppose His will and His plan for us. It is all God and we are unable to add anything to the equation, yet He demands our obedience. We live our daily lives between these two stones. This tension is exemplified in the phrase, “on earth as it is in heaven”. Our lives here on earth and the way we live them is what fits us for heaven, but our purpose is for His Kingdom to come here on earth. We must be about doing His will and letting people know about His Kingdom while we are here on earth. To sum up these first three sections of the Lord’s Prayer: We pray to, “Our Father“ (not my father – think community), “who is in heaven”, and sovereign over us, and pray that “His name would be made Holy” in our lives and actions and that we would do nothing to make it unholy. We pray for,”His Kingdom to be made known” to all people here on earth, and for us to be obedient subjects to His will “just like it would be done in heaven”. These three petitions, “Hallowed be your name”, “Your Kingdom Come”, and “Your will be done”, have long been called the, “Thou” petitions because they focus on our thoughts and prayers towards our Heavenly Father. In our next post we will turn our attention to the three ”We” petitions, where we ask God to help us in our daily lives. In our opening post we learned that Jesus and His disciples would have prayed three times a day to their Lord in Heaven. During these prayer times, they would have faithfully recited the Shema and a series of eighteen prayers called the Amidah. In light of this, when one of the disciples asked their rabbi Jesus, “teach us to pray”, it wasn’t that they didn’t know any prayers or how to pray. Rather, they were asking Jesus to give them a model of how to pray better, or how to summarize the prayers that they were already saying. We also learned that Jewish Rabbis often taught their disciples summary versions of these daily prayers to illustrate how to use them better in their private prayer time. Jesus did exactly that when he gave the disciples a model of how to pray and what to pray for. The model He gave them was a Jewish prayer from the first words to the last and came out of their daily prayer lives. The Lord’s Prayer is not then a liturgical formula or the only acceptable words in a liturgical prayer. It is at it’s heart a model from Jesus on how to approach His Father and what to pray for when you are desiring to communicate and have a conversation with Him. Let’s now take a further look at that model. The prayer that Jesus taught His disciples begins with the phrase, “Our Father who is in Heaven” (in Hebrew, “Avinu sh’ba Shamayim”). This reflects Jewish tradition and the Eastern mindset because it says, “Our Father”, instead of “My Father”. Instead of focusing on our individual needs, Jewish prayers emphasize community needs and prayers for the group as a whole. Even when we are praying individually, “Our Father” is still proper because no Christian is praying alone. We are all members of God’s household and are adopted into a distinctive union of God’s people, so that we can say both individually and corporately, “Our Father”. For further study, see also “Our Father”. It is interesting, in light of His own deity, that Jesus didn’t tell his disciples to pray to Him or to use Him as a mediator to God and call to God in His name. The Bible assumes the existence of God in heaven and never argues for it. Prayer rests on the premise that the Creator God can hear us when we speak to Him. It is also interesting to note that the name of God, the tetragrammaton or YHVH, was not used in His model prayer and in fact was never used by Jesus. Out of fear and reverence for His name, Jesus and His contemporaries paraphrased God’s name into, ”Our Father”, “The Holy One, Blessed Be He”, “Hashem” (the Name), “Adonai” (Lord), or “Elohim”. God was Jesus’ own father but He had such great respect and reverence for His name that He always inserted “Our Father”, or “ Lord”, and never spoke His name. The second part of the opening phrase, “Hallowed be your name” (in Hebrew, “ Yitkadeish Shimka”) is a little hard for us to understand since the word Hallowed is not commonly used in today’s English. “May your name be sanctified”, or, “may your name be made Holy”, are better ways to express this statement. This phrase presents somewhat of a paradox, since God’s name is the most holy reality there is. He is the very definition of Holiness. It would be like saying, “May the fire become hot”. God and only God can make His name holy, but it can be defiled by the disobedience of His children. The Holiness of God requires purity and righteousness from His people. Matthew 5:16 says, “let your light so shine among men that they may see your good works and glorify your father which is in heaven”. We keep his name from being defiled and build up his name by living holy and righteous lives. We have now completed the first phrase of the Lord’s Prayer, “Our Father who is in heaven, Hallowed is your name” and hopefully have a better understanding of what Jesus would have wanted us to think and say when we heard or spoke those lines. We will now turn our attention to the second set of words that are also a little difficult to understand in English, “Thy Kingdom Come, Thy will be done, on earth as it is in heaven”. The Lord’s Prayer, found only in the gospels of Matthew (Matthew 6:9-13) and Luke (Luke 11:2-4), is a passage of scripture that was probably one of the first Bible verses most of us learned. Even for many adults, it is one of the only portions of scripture that can be recited word for word by memory. However, if you think for a moment about the Lord’s Prayer which we so familiarly recite, a lot of the phrases sound a little strange and they really don’t have a lot of meaning to us. “Hallowed be thy name”, “Thy Kingdom Come”, and, ”Lead us not into temptation” (have you ever stopped to think about this one, the Lord leads us into temptation unless we stop Him?) are examples of things that we say but don’t really understand. Since the Lord’s Prayer is viewed as a model of how to pray, given to us by our Lord, Jesus, let’s examine the prayer closely though historical and cultural eyes and see what we can discover about how Jesus would have prayed and how he would have wanted us to pray. First of all, the Lord’s Prayer itself illustrates the Jewishness of Jesus. His model prayer to us could have readily appeared in early Jewish literature without changes. It is similar to and reflects the make up of the ancient Jewish prayers that have been recorded since long before Jesus’ time. In fact, the first phrase, “Our Father which art in Heaven”, opens many Hebrew prayers of that time period. Also, phrases such as, “May your will be done”, and “In Heaven above”, and petitions for daily sustenance and repentance are also found throughout the early Jewish prayers. The Lord’ Prayer then was not a new way to pray for the disciples, but a condensed example of how to pray and what to pray for. Next, let’s look at what might have been the pattern of prayer for a Jew living during the time of Jesus. Well before the time of Jesus, the Jewish people had developed a pattern for daily prayer. A pious Jew prayed three times a day (Daniel 6:10); at sunrise, at three o’clock in the afternoon, and finally at sundown. After the destruction of the Temple in 586 B.C. and the subsequent Babylonian captivity, the Jewish people began to think of their prayers as a substitute for the three times daily sacrifices at the Temple, which they were no longer able to perform. When they prayed on these three occasions during the day, what did they pray? The Jewish daily prayers always began with the Shema (Deuteronomy 6:4-5), which begins with the phrase, “Hear O Israel, the Lord is our God, the Lord Alone”. Then they would recite a series of eighteen prayers called the ”Amidah” (“standing”) which were always recited while standing. The Amidah was also known as the ”Shemoneh Esreh” (“the eighteen”) and “Tefillah” (“the Prayer”). Every Jew was religiously obligated to pray these eighteen prayers daily and also in time of emergency and special need. These prayers are still in use in every Jewish synagogue service today and have remain unchanged for almost 2000 years. The prayers on His nature and His holiness contained familiar phrases such as, “We will hallow your name in the world as it is hallowed in the highest heavens”. The second section contains thirteen petitions asking for wisdom, daily provision, healing, forgiveness, and deliverance from evil, and to send the Messiah. The last section contains concluding benedictions. From these examples, it is evident that the Amidah contains much of the familiar language and aspects of the Lord’s prayer; God’s Holiness, the coming of His Kingdom, daily bread, forgiveness, and deliverance from evil. Was Jesus using the Amidah as an example to teach his disciples to pray? The early sages often taught their disciples shortened summary prayer versions of each of the eighteen subjects that were covered in the Amidah, so that a person could recite them quickly if and when the need arose. There are hundreds of examples of the shortened Amidah prayers in early Jewish literature. It has been suggested by many scholars that the Lord’s Prayer was a summary prayer by Jesus of the teachings of the Amidah because of its similarities in language and style and the fact that it incorporates several of its themes. This also would have been consistent with what other rabbis were doing as far as teaching their disciples how to pray. It is interesting to note that the early church prayed the Lord’s Prayer three times a day, just like the Amidah. We know from scripture that Jesus placed and emphasis and priority on prayer. We know from Mark 1:35 that Jesus arose early and went off alone to pray. In Luke 6:12, He prayed all night before choosing His disciples. 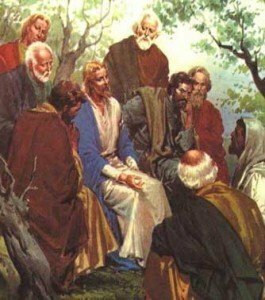 He taught about praying and wove parables about prayer, so it is not surprising that He would give his disciples some ideas about how they could pray to His Father. In our next post, we will begin to break down the Lord’s Prayer a phrase at a time, to better understand what Jesus was telling us with His example of how to pray.